It comes from the hope we nurture inside. Khun Nui has an inspiring story and she is an amazing person. This is a lady that you must meet and invite into your school or organisation. Ask her to tell her story and give her own thoughts about education and personal challenge to your students and colleagues. Then let your team spend time with her and enjoy her company for the day – she likes to eat lunch! In 2010 Khun Nui was one of many speakers at the Round Square International Conference – she had never spoken publicly before but had worked with the Regent’s students and staff for a couple of years through the community partner learning programme. When it came to speaking in front of 850 people, 77 schools from all over the world and a royal family there may have been a bit of apprehension on her part! On the day she really delivered – speaking from the heart and with emotion – there was not a dry eye in the audience. Khun Nui also received the longest standing ovation of the whole conference. Since then Khun Nui has spoken a number of times and always focused on her powerful message “that having a disability does not mean you are disabled,” something we can all reflect upon and think about when we find something challenging, difficult or even frustrating. Below is an account of Khun Nui’s story. You can also find Khun Nui via Facebook. When my father Thanakorn first laid eyes on me he was quite shocked; I was born without my arms and legs. Thankfully my father was a strong man and he promised in his heart to love me despite my disabilities. My mother however struggled to accept me for who I was. My mother’s family also felt my disabilities would bring great shame down on their decent name. They cruelly persuaded her to abandon me and my father. My mother left our home as I neared my first birthday. I would learn later that she found a new husband and immigrated to Australia. My father now had to assume the role of both father and mother. This was an immense task for him to undertake; especially in those early years. He worked tirelessly to make sure I always had food to eat and clothes to wear. Despite the difficulties my disabilities presented he was always patient and loving with me. He often reminded himself that he was blessed with both arms and legs, whereas I, his daughter, was not. My father was also very protective of me and had little patience for those who looked down on me. When I was seven years old my father hired tutors to come to my home. This would be my first step on the road to education. I really enjoyed studying and I amazed everyone with my beautiful handwriting. I also loved to research books and learn more about general knowledge. I was delighted when I finished primary education; it was my first great achievement. As I neared the end of senior high school I learned of the Tongku School for adult education. This school allowed for its students to study and work at the same time. I applied and was accepted there. I studied here between the ages of eighteen and twenty. The principal of the school, Komkrit Junkajon, was exceptionally kind and helped me a great deal. One day he came to visit me at home. He confessed to be that he found me an inspirational person who gave him great strength to fight many of the problems in his own life. He said I was a miraculous child. He said the world would be a better place if everyone had my positive outlook on life. My father got remarried. Soon I had two young brothers to play with. Unfortunately this meant the expense on our household increased and my father’s business, a car repair shop, struggled more and more. As our debt mounted my father and step-mother argued often. The stress led to my father suffering a brain hemorrhage and he passed away. This was a terrible tragedy for me. Sadness overwhelmed me. I wished I could have followed my father on his journey and not remain here all alone. I didn’t think I could live without him. His death led to further problems with my step-mom. She couldn’t handle the stress of maintaining the household and she put the blame on me. There was no love left for me in the house and I knew I had to leave. At first I had nowhere to go. My real mother was now living in Australia for over twenty years and I learned that she still couldn’t accept me and my disabilities, even after all this time. But then a former customer of my father’s shop, Daorung, who ran a tour guide company, gave me a job as a tour operator. I worked here for nine months. After I finished working here I was taken in by P’Nuch and moved to house near my old home. During this period I was desperately sad. I put on a brave face and told everybody I was fine, but behind closed doors I cried myself to sleep and prayed for my father to rescue me from my loneliness. Then, as if my father heard my prayers, an old friend of his helped turn things around for me again. After my father’s old friend heard of my plight he offered to take me to Bangkok to live with him. He bestowed on me the same love and kindness that my father did and he restored a lost spirit in my heart. 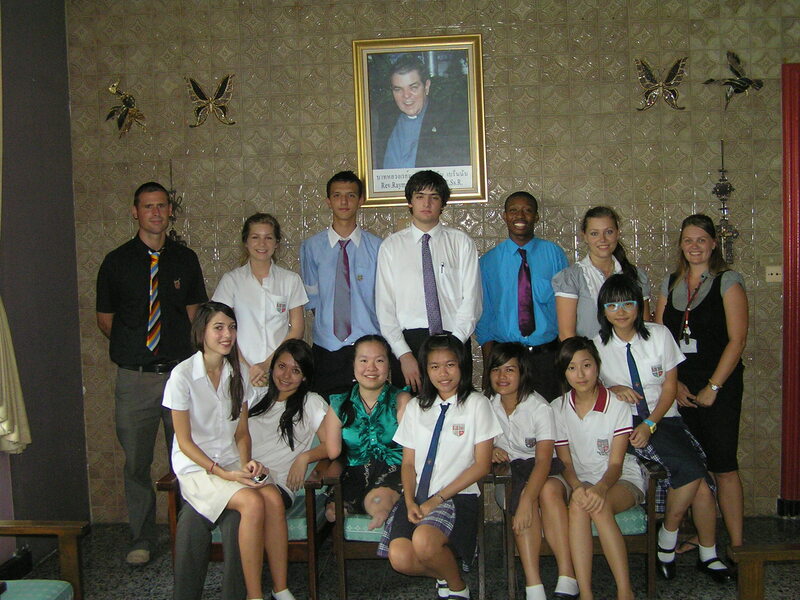 It was during this time I applied for a two year course in Computer and Business Management in English, at the Redemptorist Vocational School for the Disabled in Pattaya. This was the first chance I had to enter the school system on a full time basis. At first I was both excited and nervous. Excited at the prospect of learning, nervous that my disabilities would make me stand out. But soon this worry vanished as I made many friends and immersed myself in study. It felt like a second home for me. My grades were good and the life lessons I learned here as a disabled person was invaluable. Fr. Ray wished his students to become independent people and rightly proud of themselves; I thank him for this legacy, as do all of my fellow students at the school. My world became even larger when Fr. Deang presented me with a red electric wheelchair since I just came for 3 days. It was as if I had been given a pair of wings as now I could go anywhere I wanted to on my own. Entering my last term at the school I got a job at the Postway Company and I worked in telephone marketing and advertising. It gave me the opportunity to show that a disabled person could work as well as anybody else. My graduation day was a great success and delight for everybody. I proudly received my certificate and felt ready to take on the world. I was ready to climb all obstacles and fight for what I wanted; a good job that would allow me to support myself and a family. My next step was to begin a BA in Public Relations at Sukhothai Thammathirat Open University. I graduated in November 2008 and receive my BA on January 15, 2010 and would like to thank all who have supported me in achieving this. After Postway Company closed down I was lucky enough to be taken on by doctor Surapol as a salesperson of Zhulian Company. I traveled around Thailand with the good doctor presenting products to consumers such as toothpaste, shampoo, vitamins, ginseng coffee, wheat grass powdered drink etc… This job was my first opportunity to really see the beautiful country of my birth, Thailand, and was a liberating experience. I always wish the doctor good fortune on his travels and thank him for showing me my country. Today I work, thanks to Khun Anon and all the priests, at The Redemptorist Centre Pattaya. I really like my job taking reservations supervisor. I also enjoyed to take care all the group guests to come here and love spending time in the beautiful natural surroundings of the centre. Here I have finally found a peace in my life and can achieve all those things which my father wished me to achieve; independence, self-belief and hope for the future. This entry was posted in Challenged with a Sense of Personal Adventure, Global Mentor, Innovative and Proactive, Paul Crouch, Personal Confidence, Speakers and tagged #wewalktogether, Khun Nui by Paul Crouch. Bookmark the permalink.